James Madison was the 4th President of the United States who served in office from March 4, 1809 to March 4, 1817. What was the life of James Madison like? The short biography of President James Madison covers important information and facts about his early life, his family, career and the famous events and achievements of his political life. Our short biography of James Madison provides an interesting and easy way to learn about the life of the President. The following important facts provide a fast overview of important facts about President James Madison. Facts and Info: James Madison was the fourth president of America and best remembered as the father of the Bill of Rights and for presiding over the War of 1812 with Britain. For additional info refer to 20 Facts about James Madison. Facts and Info: He was born on March 16, 1751 at Belle Grove Plantation in Port Conway, King George, Virginia. He was the oldest of 12 children and his father was a tobacco planter and the largest landowner in Orange County. James Madison was a half first cousin twice removed of George Washington and a second cousin of Zachary Taylor. He died on June 28, 1836 in Montpelier, Virginia. Facts and Info: The career of James Madison included the roles of Politician and Statesman. He was educated at the College of New Jersey (now Princeton University). He was the Secretary of State under president Thomas Jefferson. He became the fourth president of America in 1809 and served for 8 years until 1817. Facts and Info: James Madison married Dolley Payne Todd on September 15, 1794. Dolley was a widow and James adopted her one surviving son, John Payne who was called "Jemmie" by both family & friends. Dolley's sister had married George Steptoe Washington who was a nephew of president Washington. 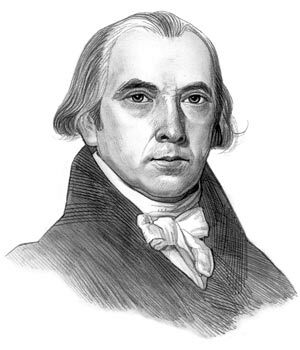 Facts and Info: James Madison belonged to the Democratic-Republican Political Party. He was 57 years old when he was inaugurated as the fourth president. Madison's inaugural jacket was woven from the wool of sheep raised at his home in Virginia. George Clinton and Elbridge Gerry stood as Vice presidents. For additional facts refer to his Presidential Cabinet members. Short Biography of James Madison: What he was like! Facts and Info: James Madison was the smallest president, weighing 100 pounds, and standing just 5 feet and 4 inches tall. He was the first president to wear long trousers instead of knee breeches All the previous presidents wore knee breeches as dictated by the fashion of the era. Facts and Info: During his life James Madison suffered from chronic arthritis. He also suffered from frostbite to the nose which occurred when he was out campaigning for the First Congress in 1788. Frostbite is caused by exposure to extreme cold when the skin is frozen and it can result in gangrene. James Madison was lucky as the injury only resulted in a scar on his nose. Facts and Info: He died of natural causes on June 28, 1836 in Montpelier, Virginia. His last words said on his death bed were "I always talk better lying down." James Madison is buried in the Madison Family Cemetery at Montpelier. The short biography of James Madison provides a fast overview of the key facts and events about his life and the accomplishments of his presidential term in office. The following James Madison video enables you to sit back and listen to the history of his personal and political life - a useful educational resource for kids, children and schools learning about the life of President James Madison.